During my visit to my father’s childhood home in Hiroshima last summer, I was entrusted with hundreds of vintage family photos and mementos. I brought them back here stateside, promising my Hiroshima family I would “restore” them. Well, after a good start, I developed a painful case “tennis elbow” from using the mouse so much during the retouching process. Sadly, it came to a screeching halt sometime in November last year. 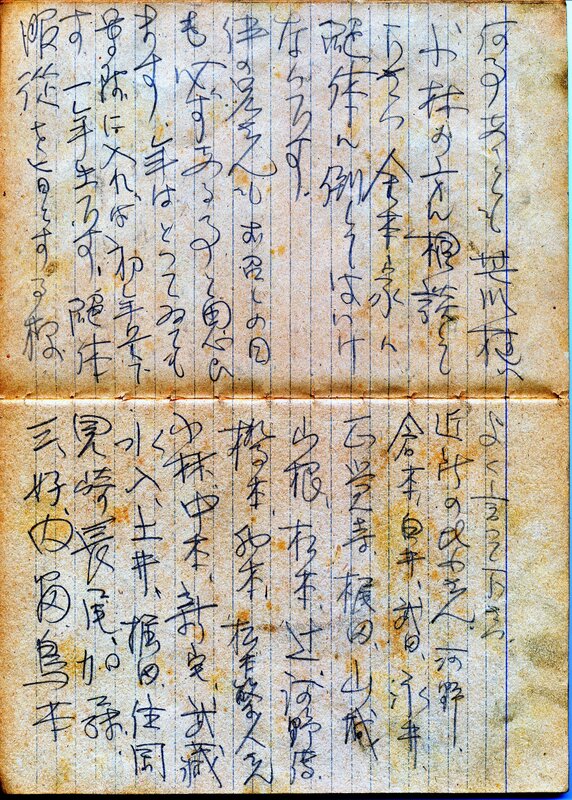 But one very, very special item was entrusted with me – my Uncle Suetaro’s war diary. 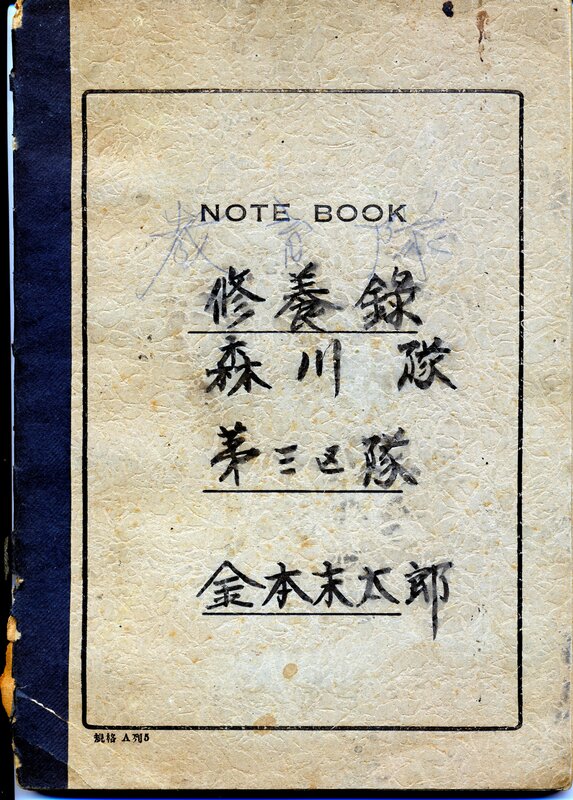 Although born an American citizen in Seattle with the rest of his siblings, he was writing this war diary as a sergeant in the Japanese Imperial Army. The last entry was a farewell letter to his Mother. 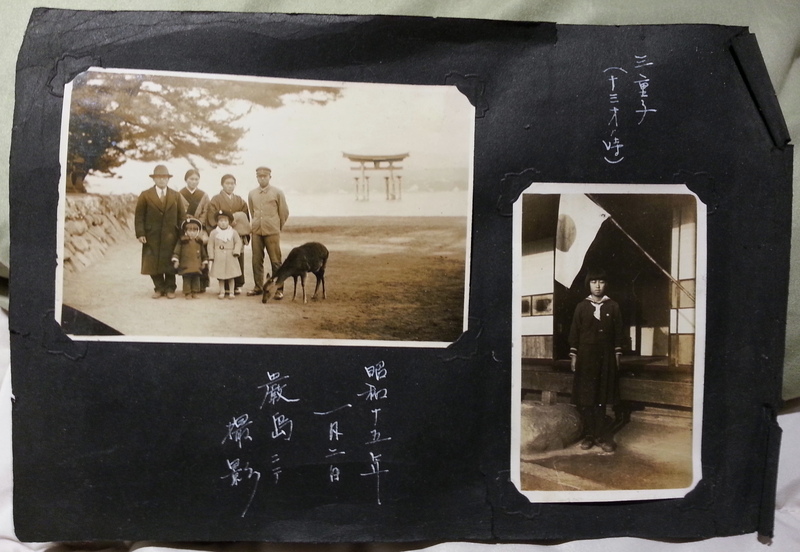 The photo above had been secreted away behind another photo that was in Uncle Suetaro’s album. He meticulously kept the album up to the time of war. 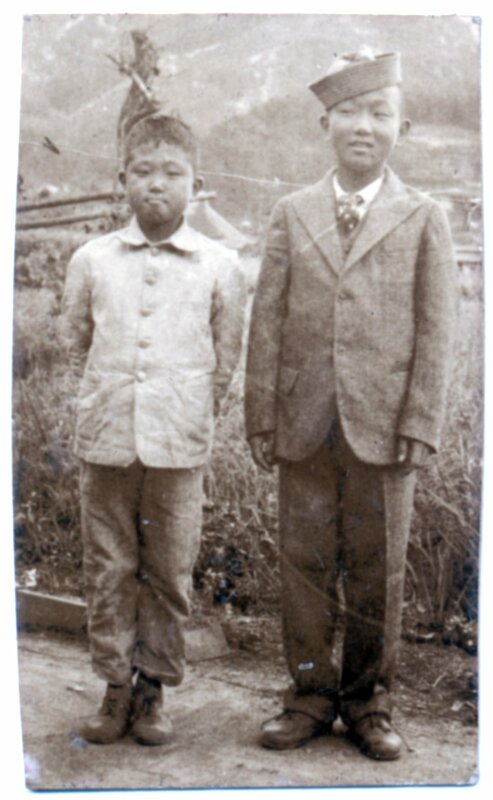 His oldest brother, my Uncle Yutaka, had conscientiously sent him family photos they had taken in Chicago and Los Angeles before imprisonment. Suetaro complimented the photos with his beautiful Japanese calligraphy, written in a silver, whitish ink. 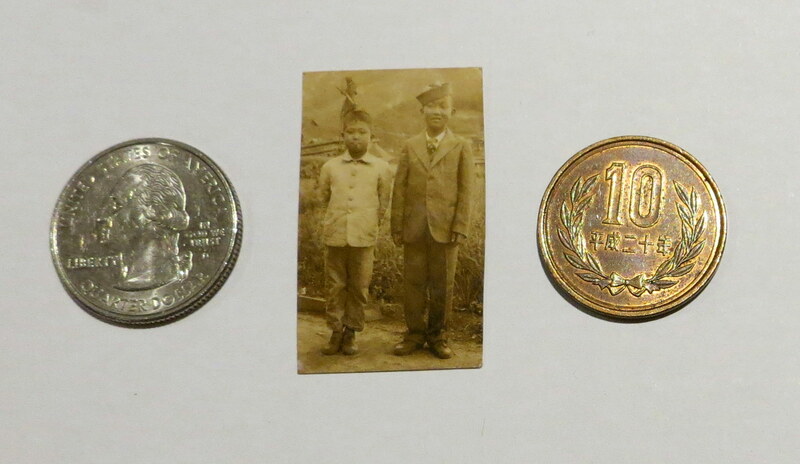 The photo of Uncle Suetaro and my dad shown at the beginning was so very tiny – but there was something Uncle Suetaro loved about it to keep it. I wish I knew what it was. 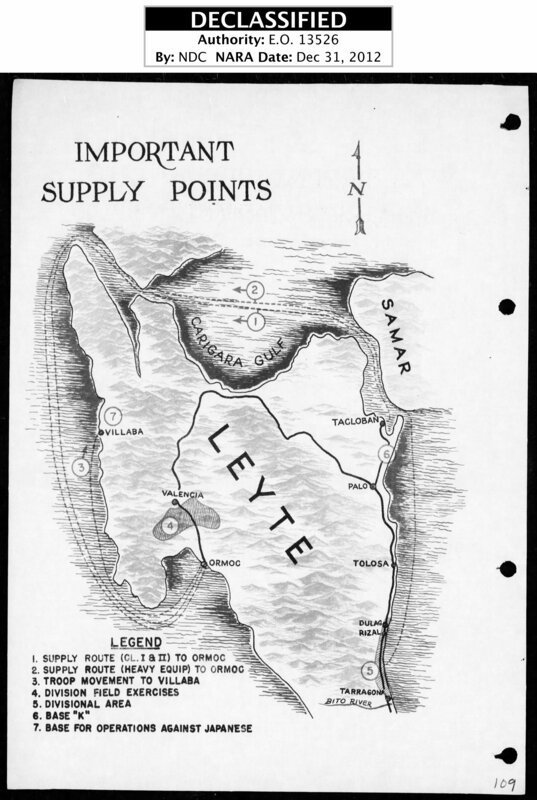 Uncle Suetaro was killed as a sergeant major of the Japanese Imperial Army on Leyte apparently near a town called “Villaba”. 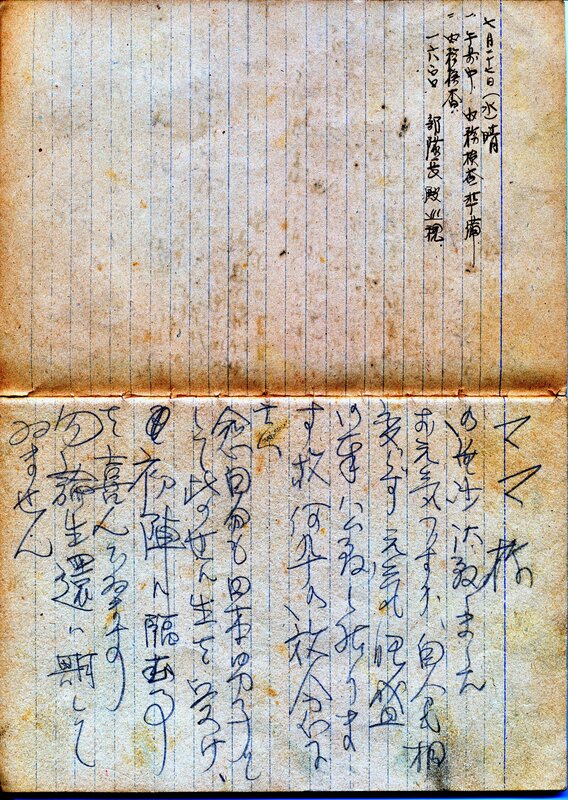 Below is an actual page from a “war diary”, an official report written and published by the US Army. Villaba is located on the western shore of Leyte but not far from Ormoc Bay, which was a killing field for Japanese ships by US aircraft. His remains were never recovered. In the family grave are his tiny pieces of his fingernails and a lock of hair. It was custom at that time to leave parts of your earthly body with your family as returning was unlikely. Not much to bury… but it was better than not returning at all. In a spiritualistic way, he had never left. This is his farewell letter to his Mother (my Grandmother). It is clear it was very hurriedly written. 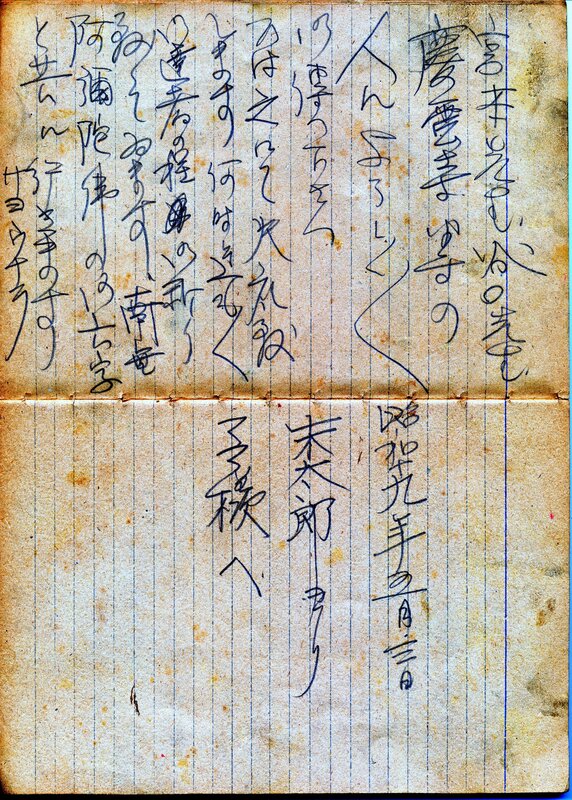 With the help of my cousin Kiyoshi in Hiroshima and my dad, we’ve typed up Uncle Suetaro’s farewell letter – complete with old Japanese characters and translated as best possible into English. When reading this, please remember these are the words as written as a soldier going off to fight the Americans – but he was once a young American boy born in Seattle, WA. Cover. His name is at the bottom. I am sorry for not writing for a while. How are you? As usual, I am full of life fulfilling my duty to my country so please feel at ease. More and more, as I realize I was born into this world as a Japanese male, I am overjoyed to be going into my first combat. Of course, I do not expect to come back alive. And for you, Mother, whatever happens, do not be taken by surprise and please fight back with even more energy than you normally would. I deeply apologize for these 24 years of worry and concern I have caused you. 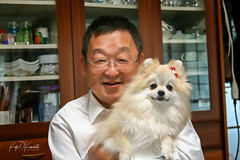 At this time, Japan is at the boundary of either winning or perishing. I still dream that we can free our older brothers (from forced imprisonment in America by FDR – Ed.). Please do not worry about me but instead, please take it easy on yourself and live a long life. If something comes up, please discuss it with the Kobayashis or Aramakis. No matter what, do not allow the Kanemoto name be extinguished. Mikizou-san will also be drafted. Although he is much older in age, he will be treated like any other draftee. As a young recruit. Implore upon him to obey every command without question. With that, I will say farewell. I pray for all eternity for your good health and prosperity. I go blessed with the six realms of Namu Amida Butsu. His farewell send-off is pictured below. 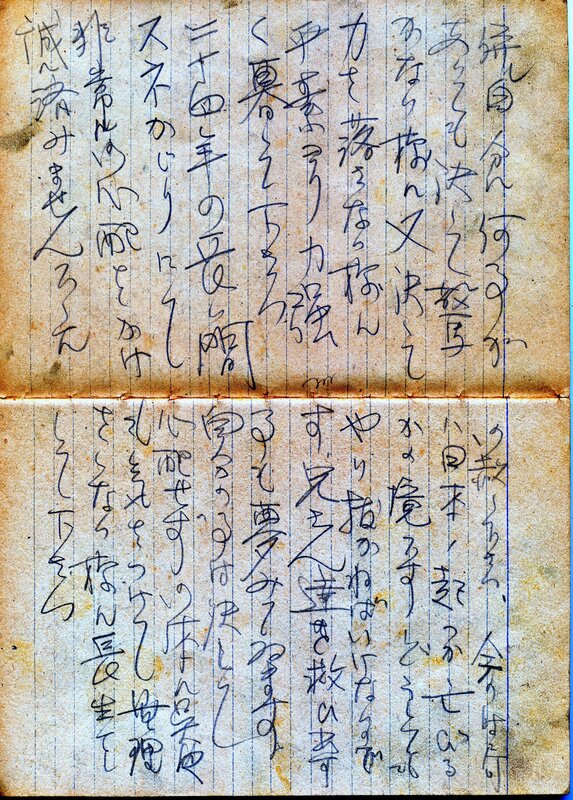 Masako-san believes Suetaro wrote the letter around this time. It was at gatherings such as this when a Japanese soldier was given a “good luck” battle flag – the ones that many WWII combat veterans “removed from the battlefield” as souvenirs. There are many cases now where their sons and daughters – or grandchildren – are making efforts to return such flags to the Japanese families. 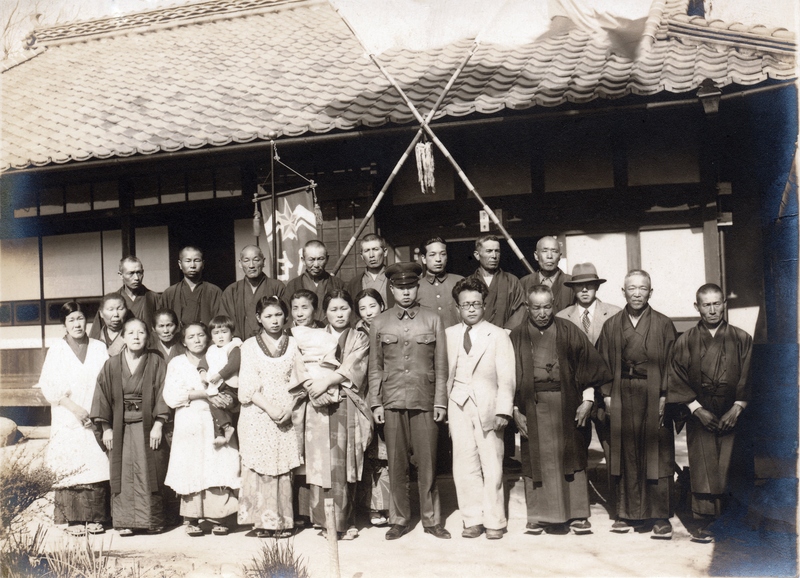 Uncle Suetaro (center) is pictured just before going off to war and his death. You will notice my grandmother is missing from the photo; that is because she suffered her first stroke knowing her last son was going to his death. On a much smaller scale, though, Grandmother Kono was all who was left in that house when war’s end came. 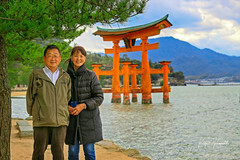 Her precious son Suetaro – who she kept from returning to America for the purpose of keeping the Kanemoto name going – was dead. She was now alone. I wonder how she felt. Grandma and four youngest children at the corner of King and Maynard in Seattle, circa 1926. 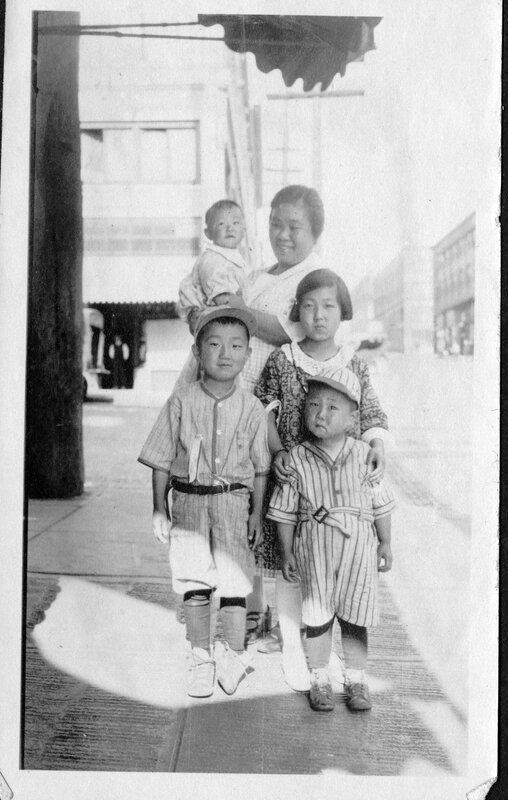 From clockwise right-front: Suetaro, dad, Mieko, Grandmother Kono and Shizue.